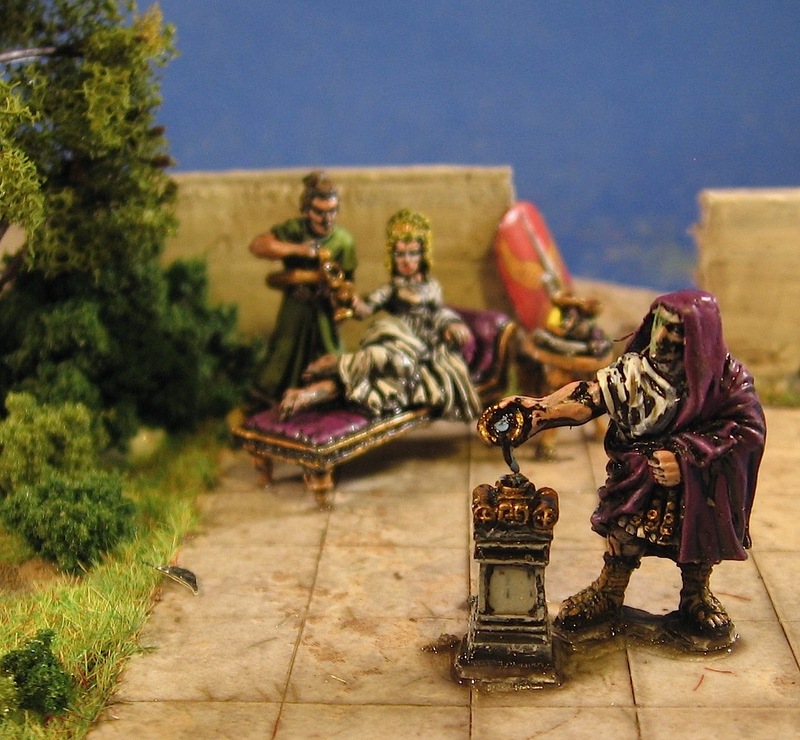 I got distracted today by some 28mm late medieval figures (old Zvezda Ring to Rule fantasy figures) this afternoon. 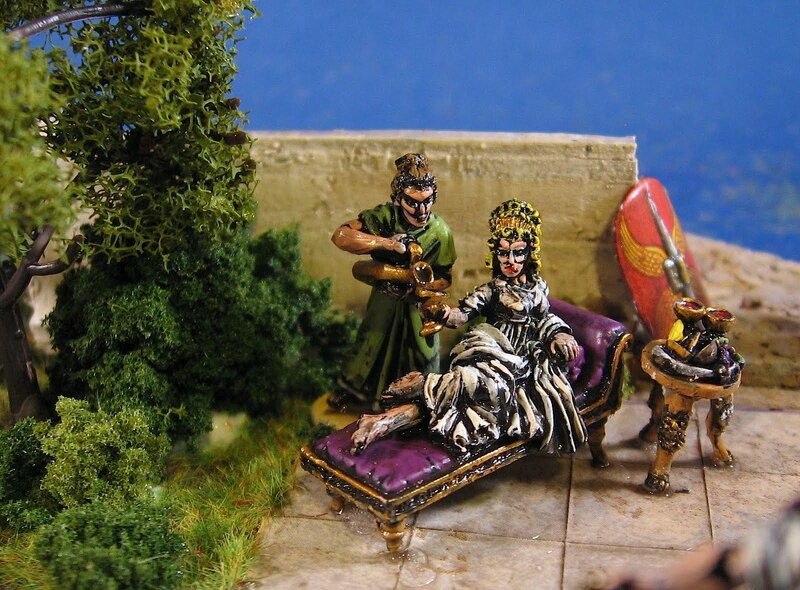 But I did manage to mostly complete a 28mm Roman camp for my DBA/HoTT Marian Romans. This is my first large-scale modeling project and I'm learning a lot as I go. The front two thirds is finished. 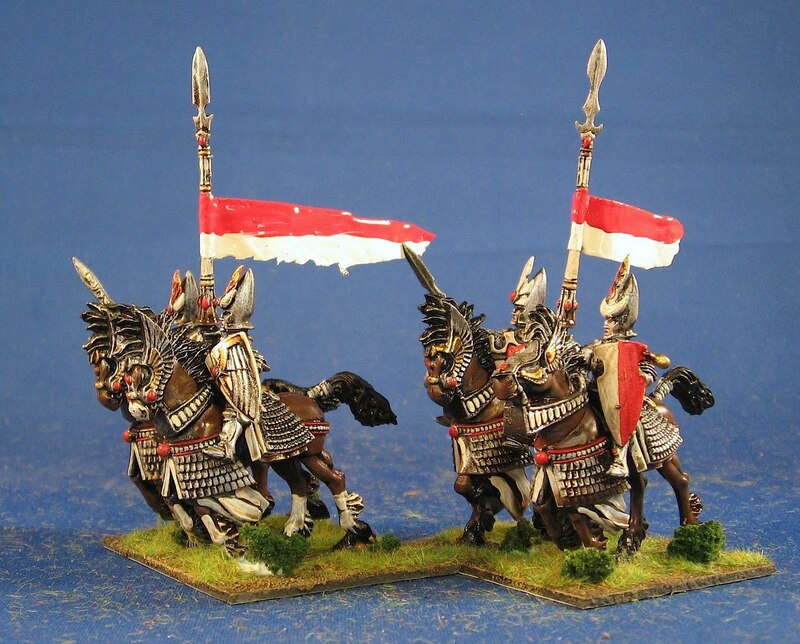 I used Warlord Games 28mm metal figures. The serving girl comes with two amphora (i.e., "big jugs" on the packaging). 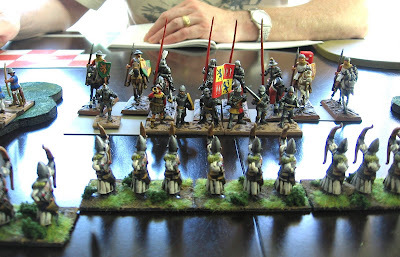 These were nice but a bit smaller than the Wargames Factory Romans I'm using for units. Not sure what is going on with the fellow's face below--some sort of reflection obscuring the details, I think. Where I'm having some difficulty is what to do with the patio section behind the figures. I'm of two minds. The first is to clutter it with gear (rolled tents, shields, spears, crates, etc). 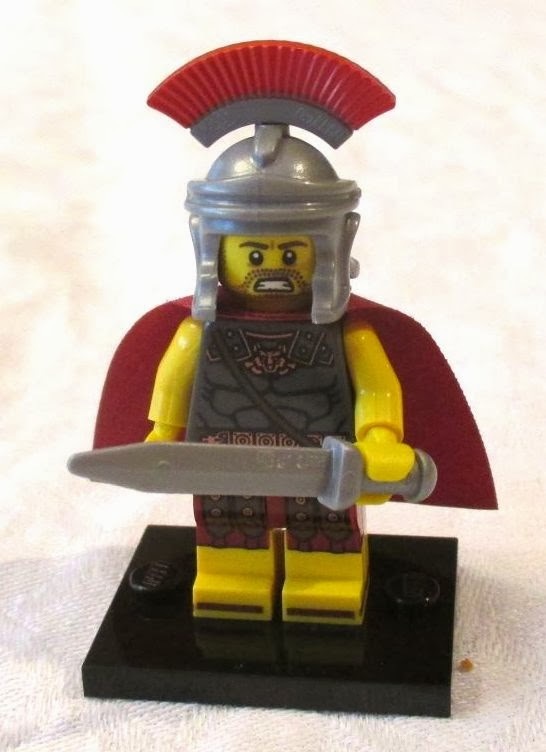 The other idea I have is to populate it with Romans awaiting the results of the auguring. Suggestions anyone? Up next: Two bases of late medieval foot (bow and spear) need to be dipped then based. 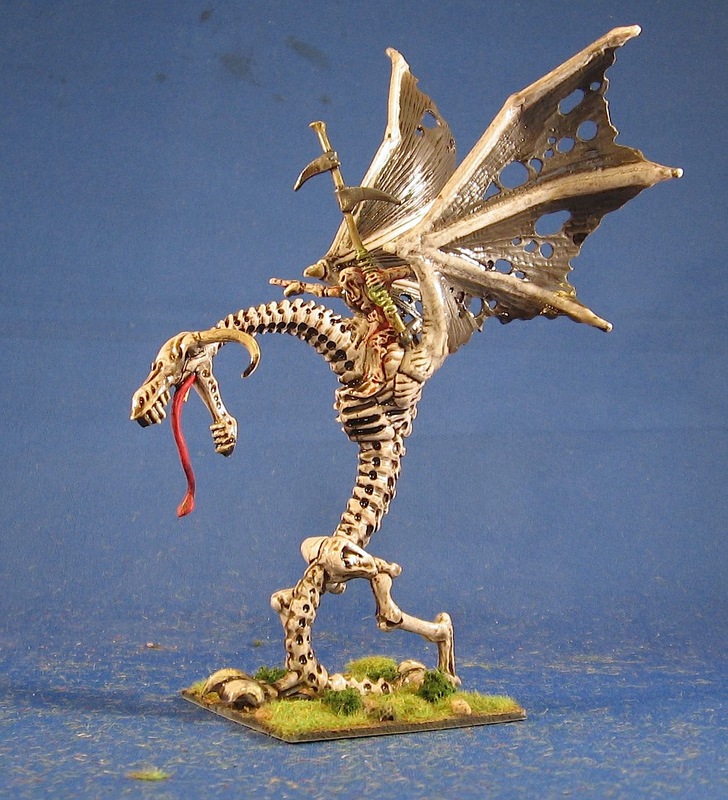 And I have 20 skeletons painted and 20 primered. 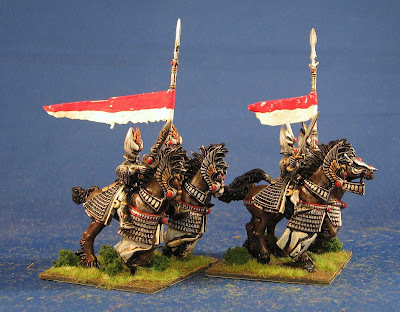 I'd like to create a mixed unit so I will hold of basing them. I also need to get my AWI game together for the club on Tuesday. While family visits and some yardwork have kept me busy, I have managed to finish up two small projects. 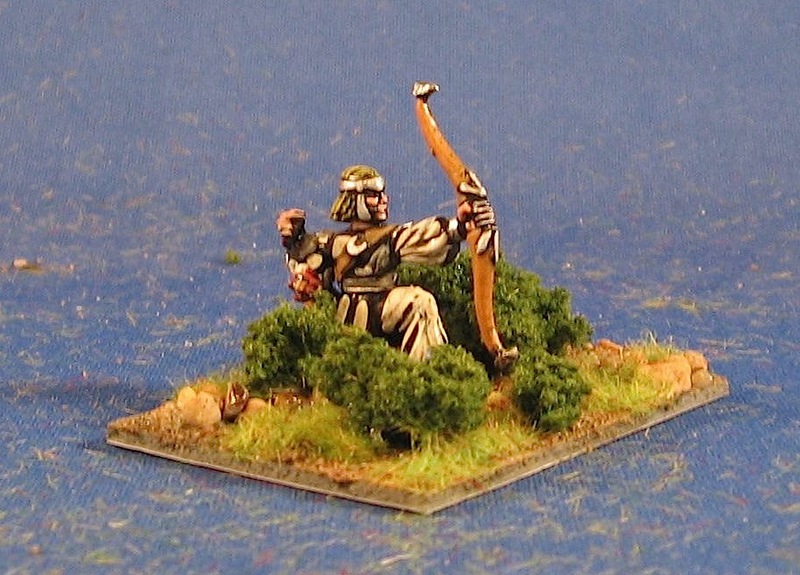 First up were some 28mm High Elf archers. I also did a High Elf lurker, based up my most recent experience playing this army. This completes a second High Elf army of 34 AP: 3 spear, 5 shooters, 1 artillery, 1 lurker, 1 flyer, 2 riders/knights, 1 magician and 1 dragon). I have also been painting up some skeletons that I got from Scott in trade at the club last week. 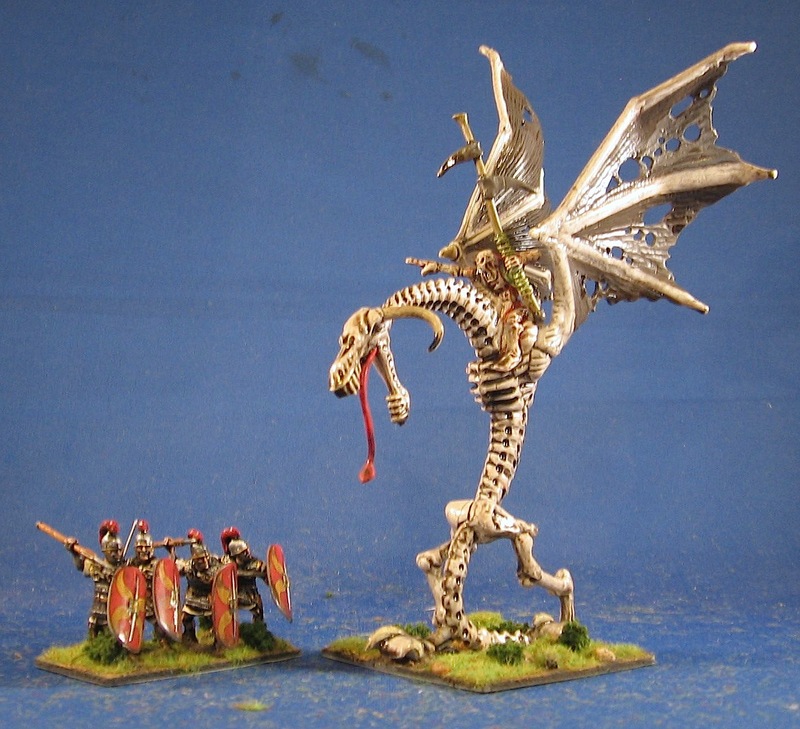 While these are still being painted, I did finish a skeletal dragon with rider. 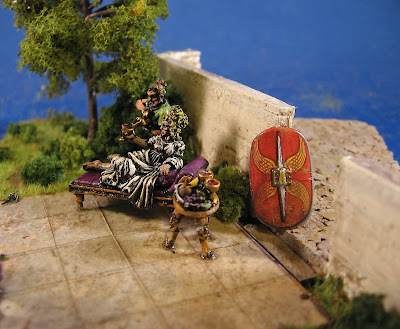 I have included some 28mm Romans here for scale. At the very least, this fellow is impressive! Up next: Some 28mm skeletal hordes as well as a camp for the Marian Roman army. The figures are painted--just working on the camp itself. I may need a trip to a hobby store today for some trees and more flocking. In the longer term, I will also do a camp for my 28mm Celt army--again the figures are painted--just landscaping to work out. 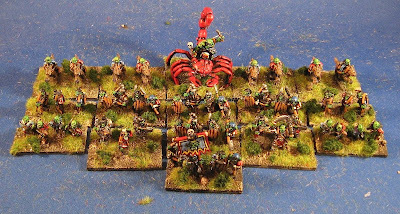 FS: 15mm HoTT Orc Army--SOLD! 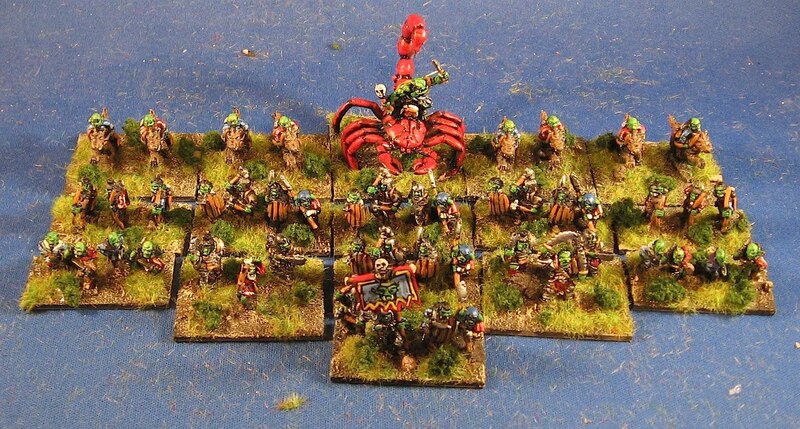 I have for sale a painted 38-AP 15mm HoTT Orc army. It comprises 16 bases, 9 mounted figures and 40 foot. All of the figures have been hand painted by me and come from a smoke/pet-free home. I'd like $65 (which includes postage in Canada or the US) for the army. 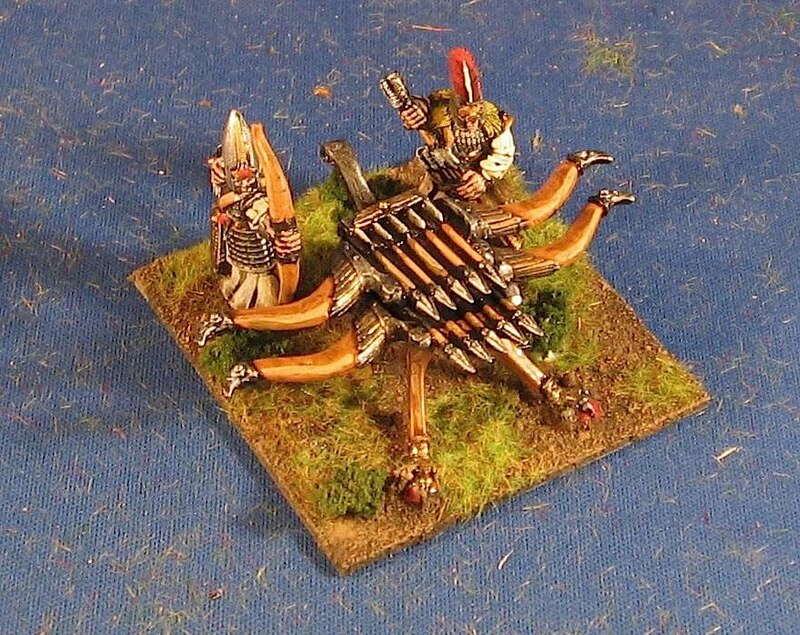 I'd also do a part-trade for some 28mm GW High Elves. 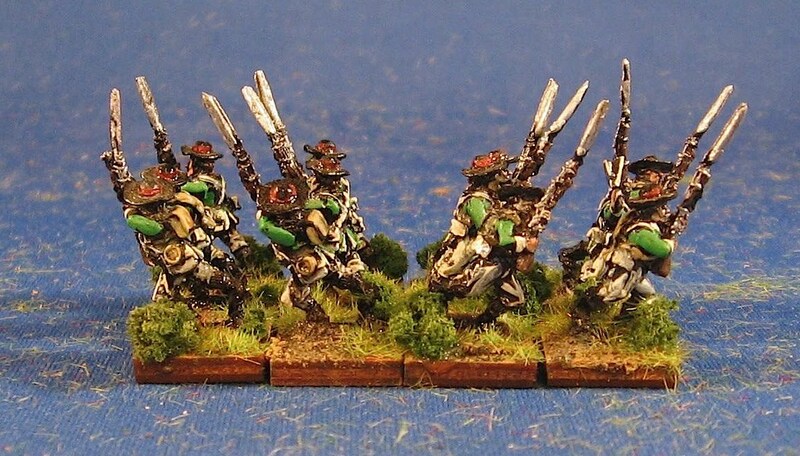 First up are four bases of Warg Riders. 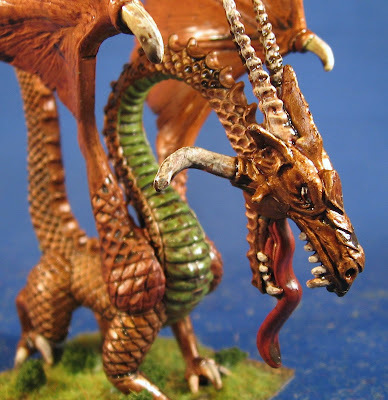 These fellows have striped shirts and I painted the Warg's teeth (not sure if that shows in the picture). 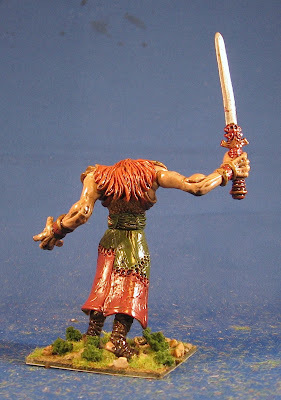 All of the flesh on all of the figures has also had a highlight done. 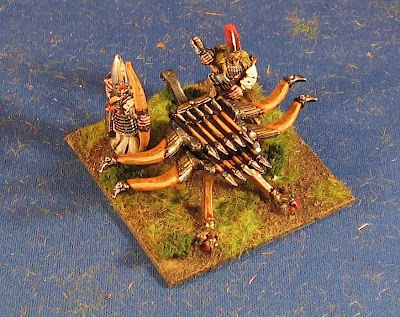 There are also two bases of shooters and two bases of goblins. The goblins could be warband or lurkers, depending on your mood. The core of the army are five bases of Orcs. 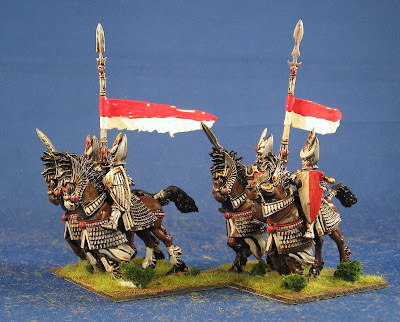 I'd play these as Warband or spear. This also includes a general element with banner. 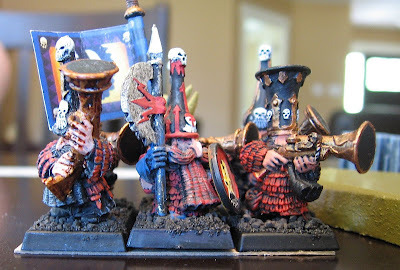 It is hard to tell from the front-on picture but I have given these guys fairly bright clothes (perhaps Sauron was in a jokey mood that day?). The idea was to make them bright and gaudy rather than drab and dreary. There is one base each of magician and hero, each of which would also do for a general. 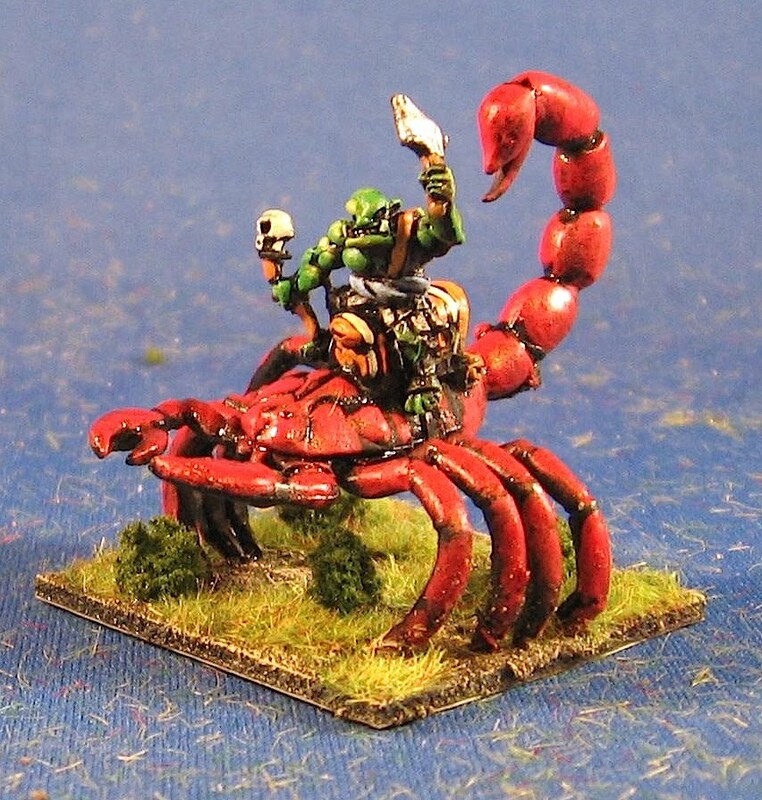 Finally, there is a fellow riding a scorpion as a behemoth. This is a nice model from Reaper. Overall, a nice balanced army. Queries to bob.barnetson@shaw.ca . 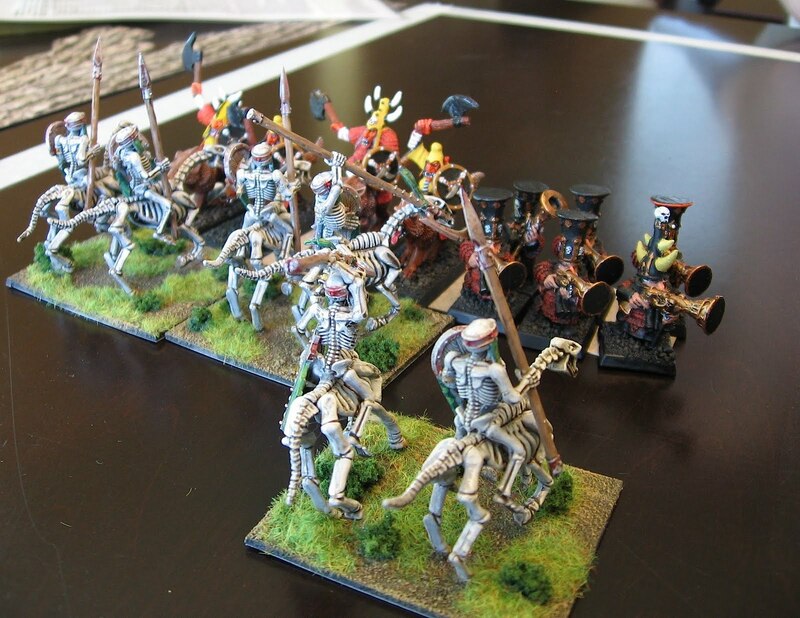 Up next: Some 28mm High Elf shooters and then on to skeletons. Well, I guess the elves had better get on some ships and sail west as the time of human has come. 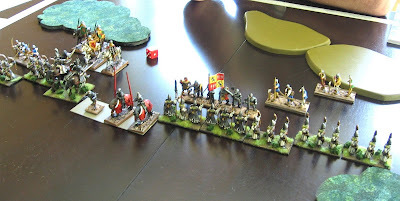 Dave came over yesterday for some HoTT gaming and brought his Arthurians. 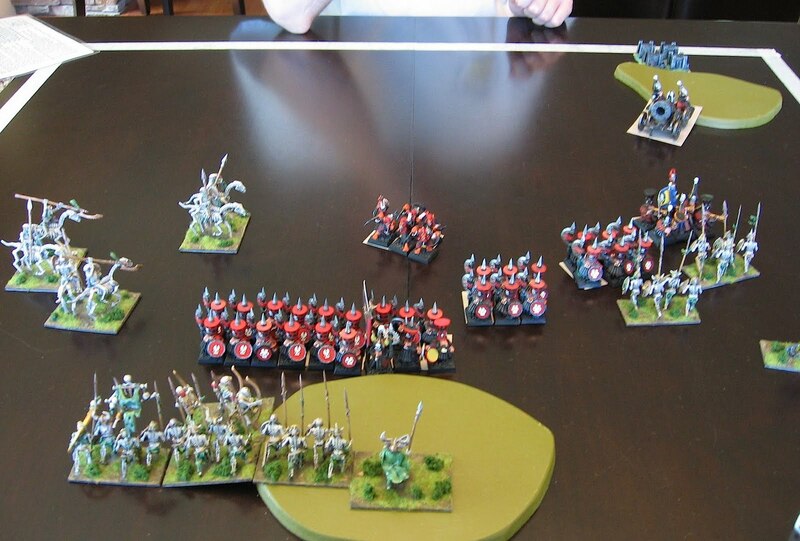 I gave the elven army I sold a quick playtest before shipping it. What a debacle! Game 1 was won with superior generalship by Dave. Good match-ups on his part--dang his general was a good unit! Eventually he killed my general and that was game. 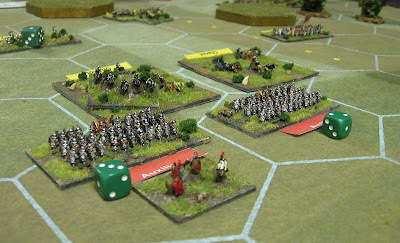 Game two saw dice betray me again against superior tactics. but I learned something important about the value of bow in woods! Then I rolled five one's in a row and lost five freaking' units (the entire centre of my line)! I managed to hold out longer than I thought but what can you do when you are one unit away from destruction? Good lessons, though. Up next: 15mm Goblins are just about painted and then on to skeletons and perhaps more elves (depending on what the postal carrier brings today). 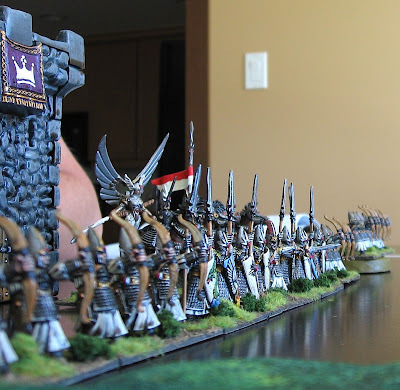 28mm High Elf HoTT army for sale--SOLD! 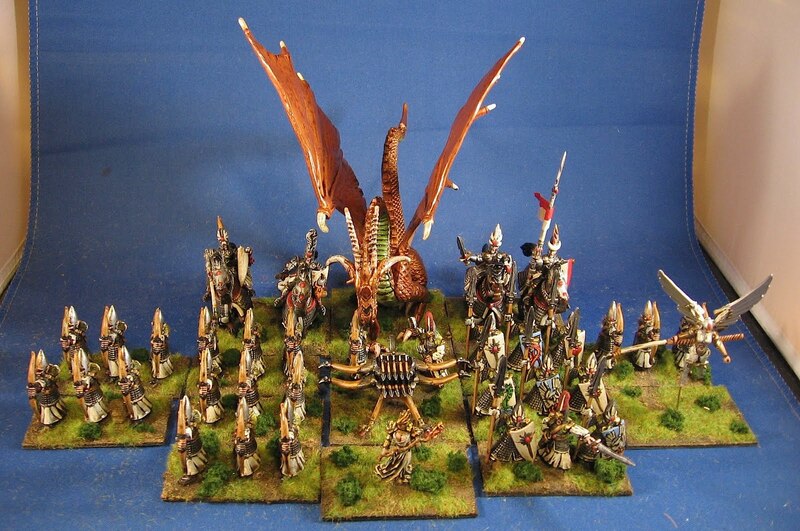 I have for sale a 28mm High Elf Hordes of the Things (HoTT) army. It comprises 15 bases with 36 figures and totals 35AP. 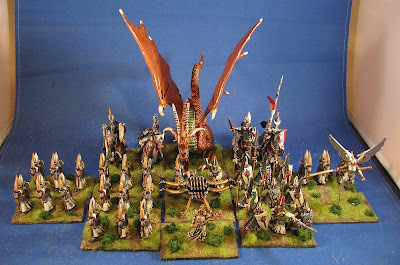 All of the figures are plastic and GW (a few exceptions noted). 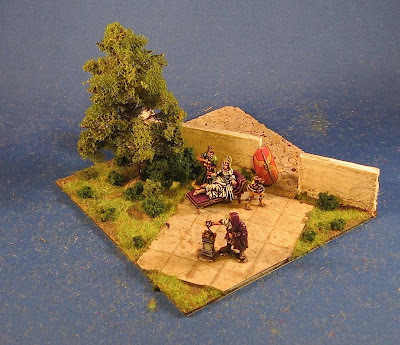 All bases are 60mm frontages. The majority of the army is shooters, with six bases. 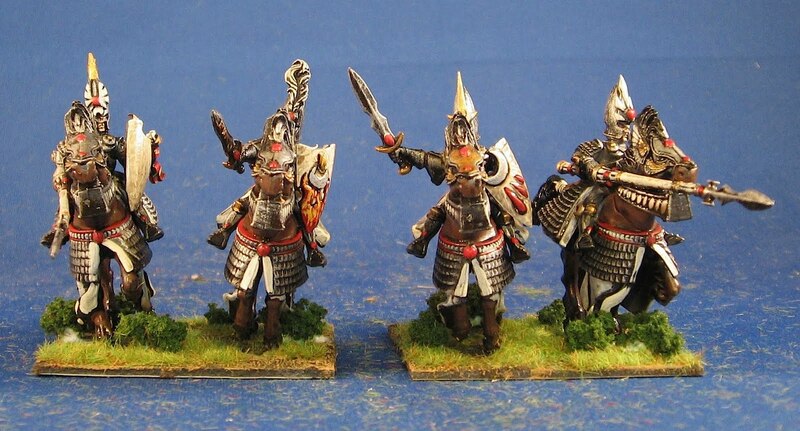 There are also three bases of spear, including an optional spear general (the fellow with the sword is metal GW). 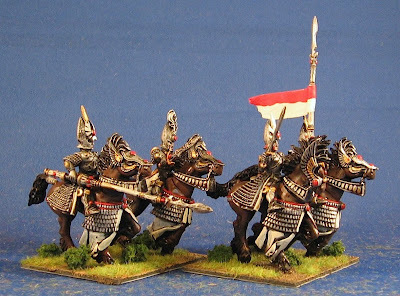 There are two bases of riders and the fellow with the pennant could be a rider general. There is a flyer and a dragon. 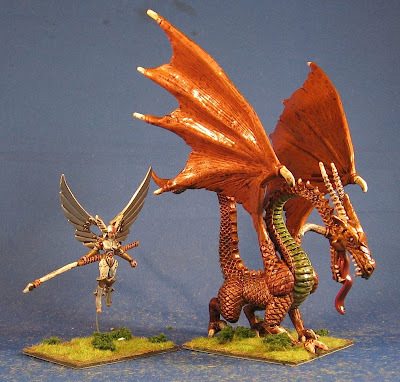 Both are plastic but non-GW (Heroscape or Mageknight, I think). 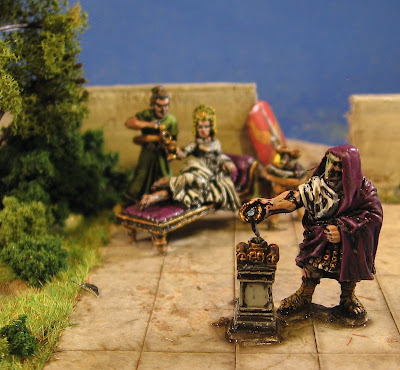 There is also a magician (plastic Heroscape or Mageknight) and an artillery piece (metal GW with a plastic bowman added). I'd like $100 for the army. Shipping will be $20 in Canada or the US; more overseas. Payment by paypal, I will insure it, etc. We had 11 guys out at the club last night with three games going. 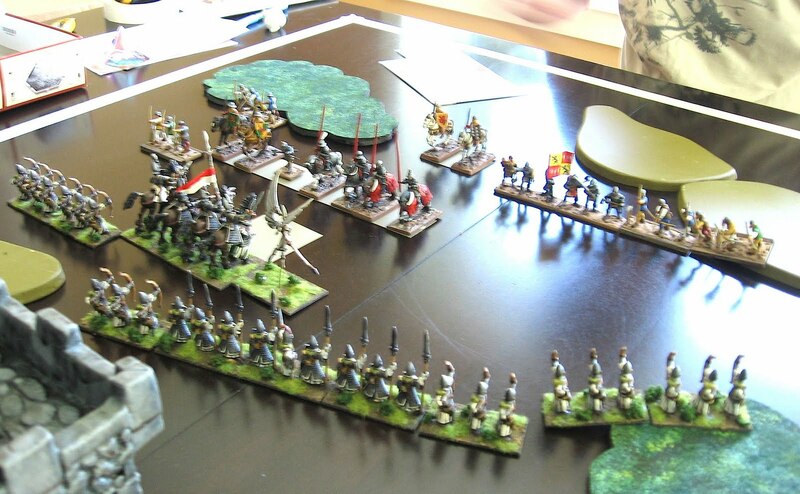 Justin put on A Leader of Men, which was a card-driven WW2 game using 15mm eastern front miniatures. I think Duane, Dave P., Barry and Cory played in it. Dave C and Mark played Songs or Blades and Glory. 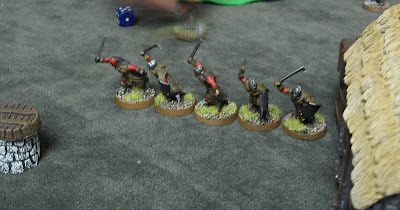 All of my pictures turned out a bit blurry for that game except these fellows. 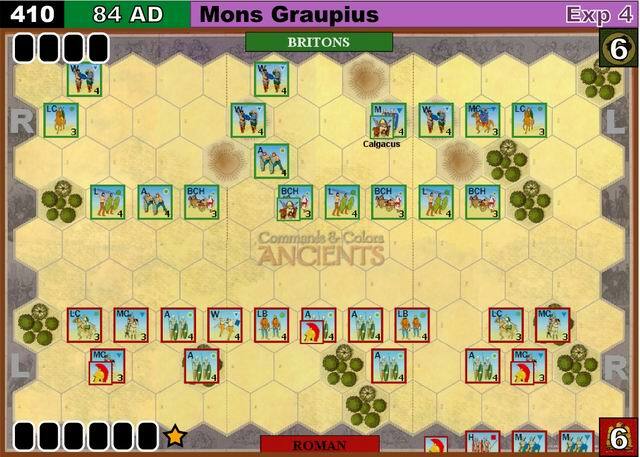 Kevin and Scott challenged Chen and me to three games of CCA, using the official Mons Graupius (84AD) scenario. I thought this would be a walk for the Romans (as it was historically) but each team managed a win with the Caledonians. 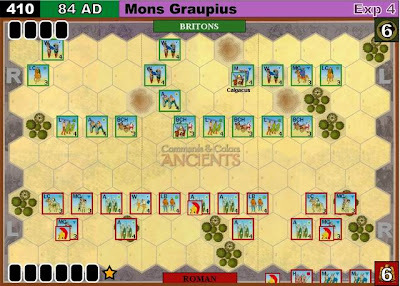 So it came down to a tie-breaker--could Chen and I manage a win with the Romans. Good rolling and a cagey play with a mounted charge card meant yes (albeit barely). Up next: Some HoTT action, some 15mm HoTT goblins and perhaps some skeletons. I finished up the elven HoTT army this afternoon after a few hours at the splash park with the family. I've done four bases of horse. 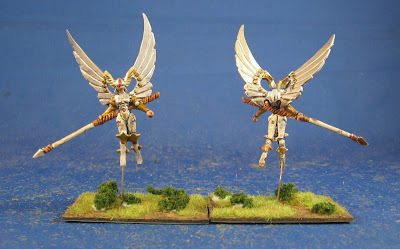 These are plastic GW models I got on sale at Mission in June. Two bases I did with flags to give rider general options. I also put together two flyers. 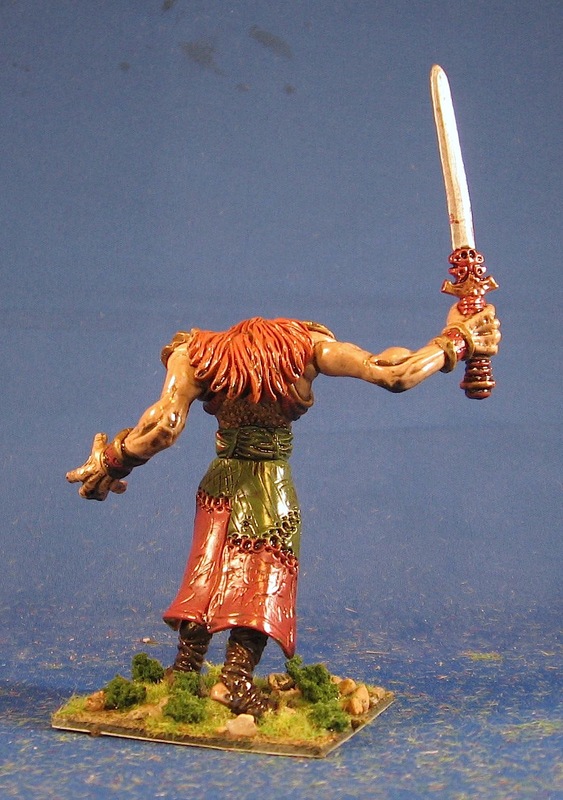 These are Mageknight or Heroclix figures with a quick repaint. 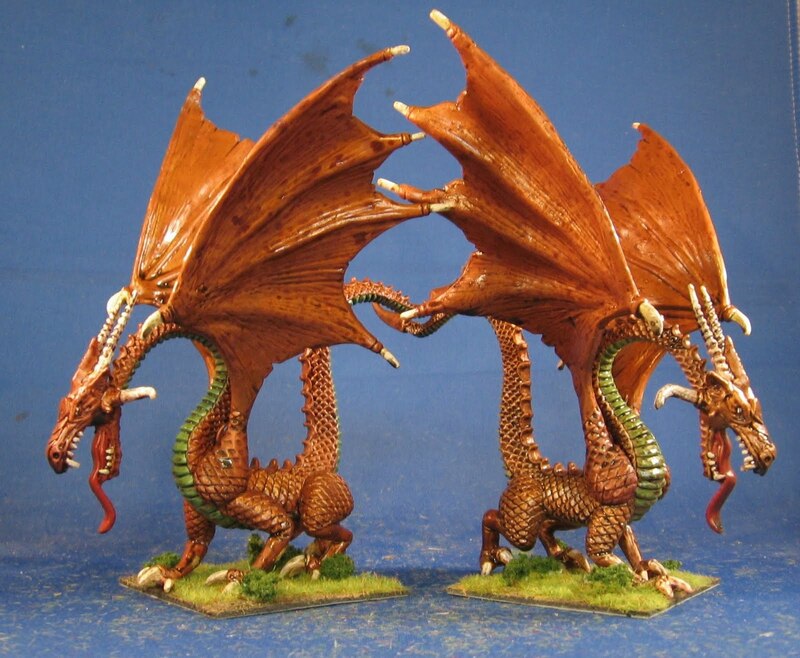 I also used similar figures as magicians, although much more repainting was necessary. 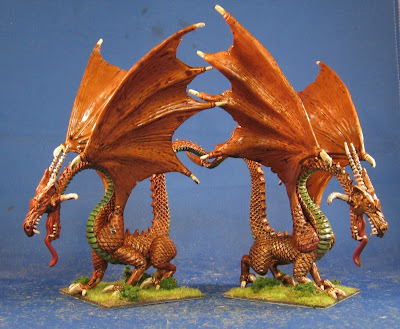 Finally, I did two dragons. The detail on these is good, especially with a few highlights added. Up next: The club tonight and a game tomorrow mean actual gaming! 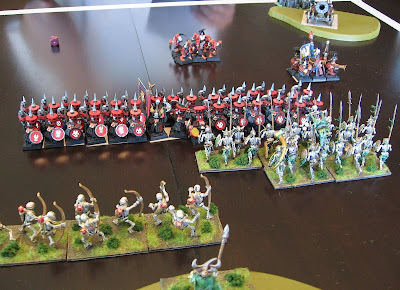 Thereafter, some 15mm goblins and some 28mm skeletons although there is the matter of the fence I promised to help with!. Last night I finished the remainder of the 15mm AWI fellows I had agreed to paint. These are some Loyalists and I think the figures are Old Glory. Overall a fairly easy paint with the raised detail on the Old Glory figures. I'll pop these in the mail this afternoon. 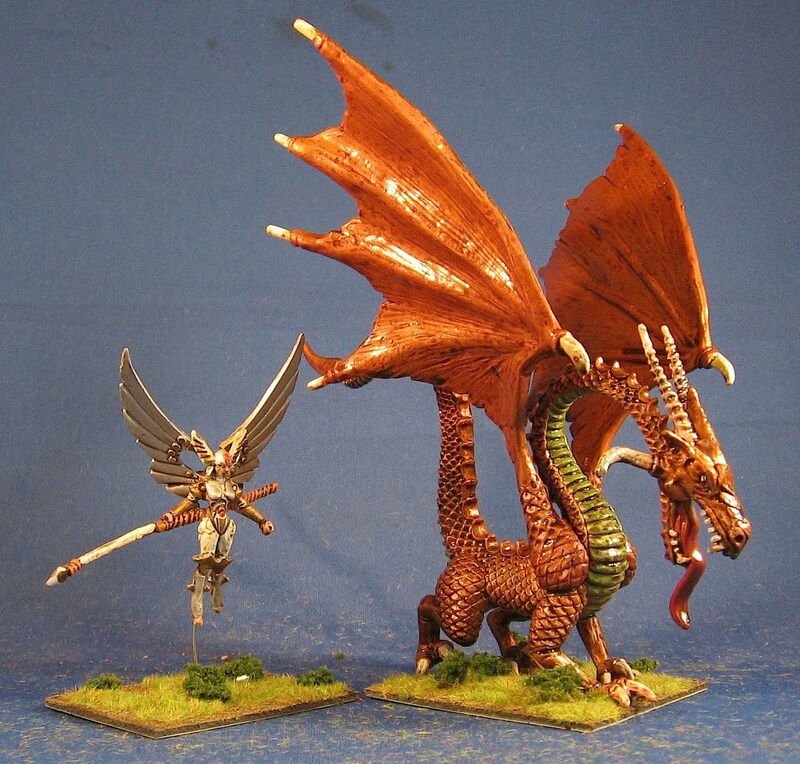 I also washed and based a behemoth for HoTT (likely the dwarf army). 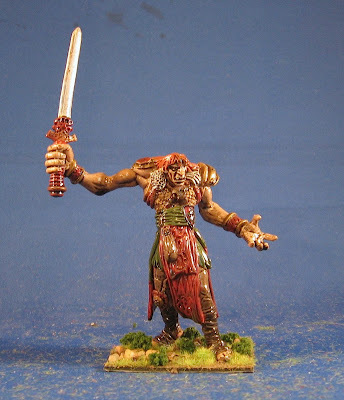 This fellow is a heroscape giant of some type. 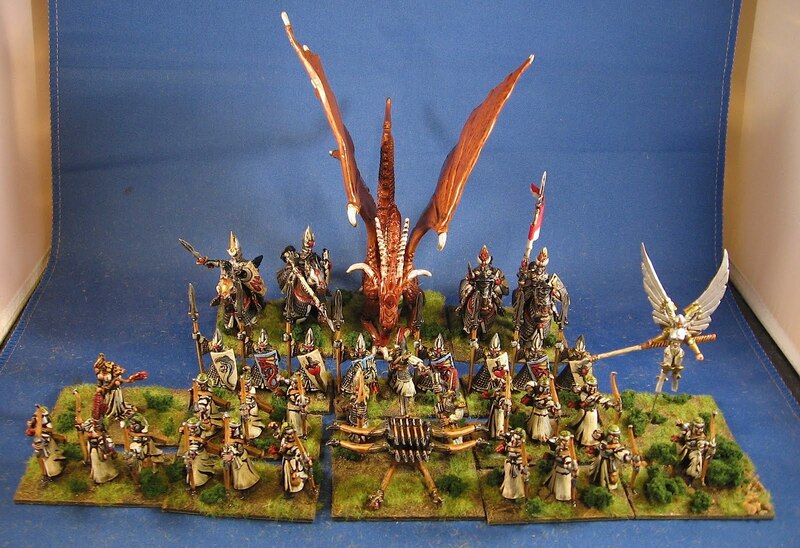 Up next: The remainder of the 28mm Elven army (horse, dragon, flyer, magician) should be finished this afternoon. There is also the club tonight. And I'm working away on some 15mm HoTT goblins. 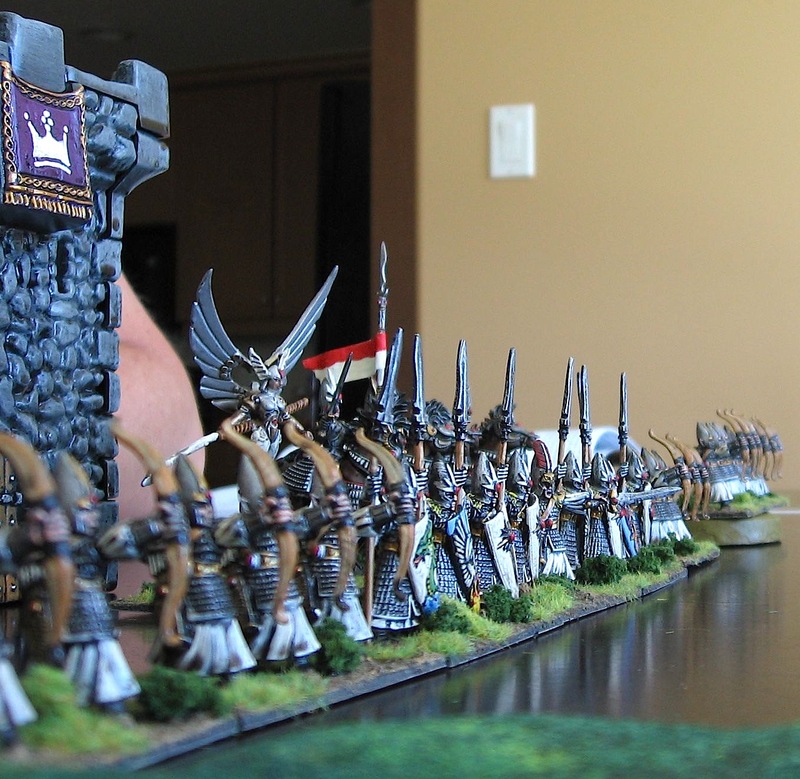 This morning I finished basing a bunch of GW High Elves for HoTT. The cavalry are drying now. Add in a couple of magicians and I'm done. 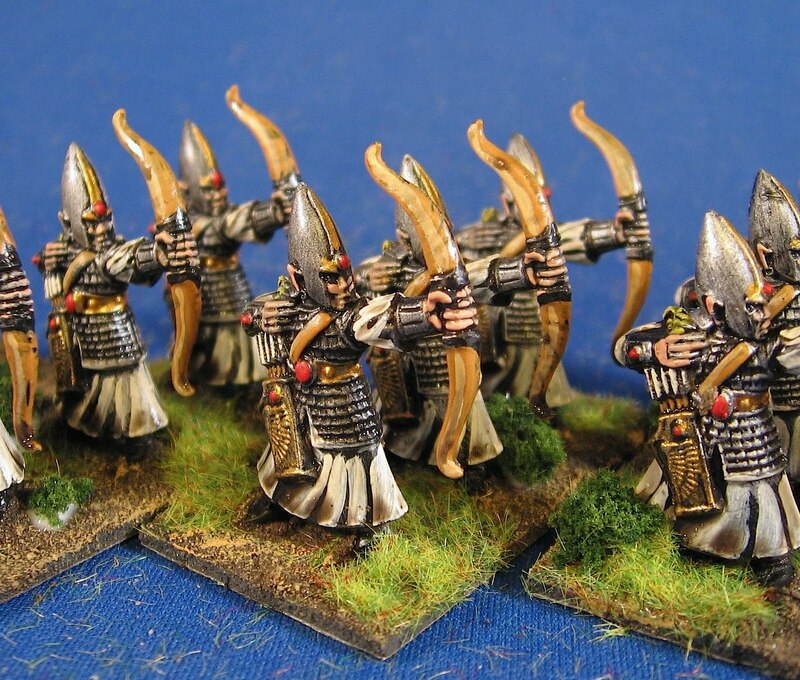 Up first are two groups of spearmen. 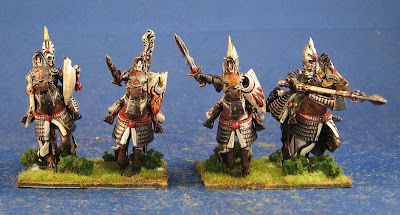 These are plastic except for the commander with the sword, who is a metal crew figure I swiped from the bolt thrower set. And a second group of spearmen, again with one stand having an officer. I also acquired two metal bolt throwers, adding an extra archer to fill out the crew of each. 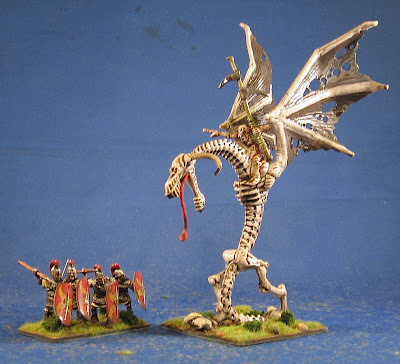 These are quite nice models. Finally, since this a shooty army, I painted a buttload of archers. 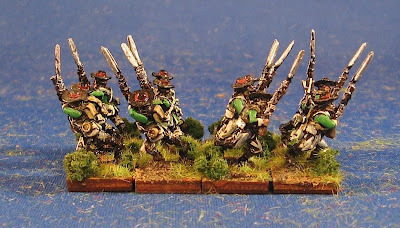 The cavalry elements are just drying now and should be ready to photograph on Wednesday. Up next: The last of the 15mm AWI bases are drying along with a giant. 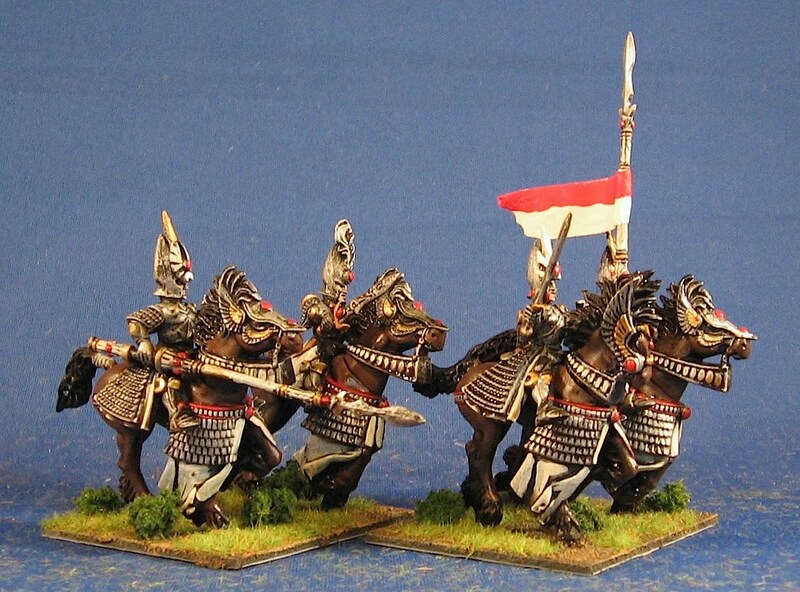 Plus some elven cavalry. I'm awaiting a few skeleton reinforcements before I go back to them so I have a 15mm HoTT Orc army ready to spray prime if the weather breaks. Craig bought his girls by this afternoon to play (some HoTT) and I continued to lose with my undead. But I improved my play somewhat so that is what I will hold on to. This time the beat down was administered by chaos dwarves. On the left we had a cavalry battle that I eventually won. ...to get slaughtered again. 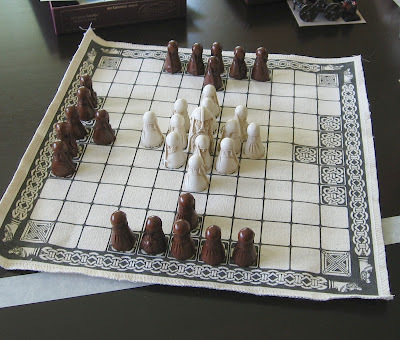 A couple of bad decisions on my part, no terrain to speak of and bad dice for the first half were also unhelpful. Craig also brought out cool viking game he picked up in Denmark. 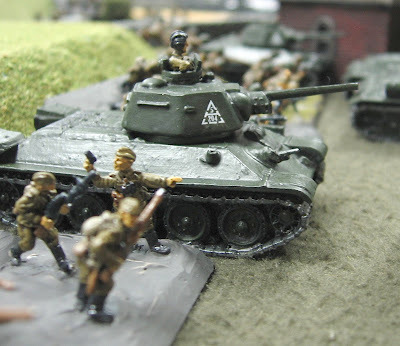 Up next: My last 15mm AWI will get based to night. 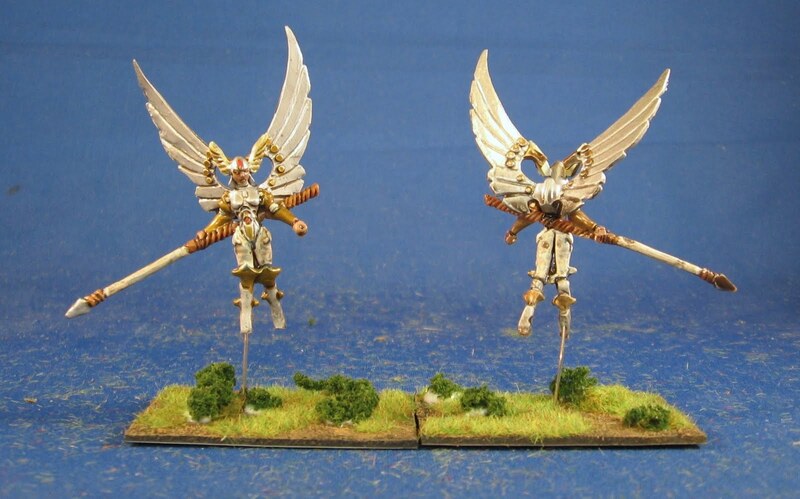 And I should have some 28mm high elves ready for tomorrow. Tuesday is also the club.